Eddie Hill is serving 71 years to life in an Ohio prison. I’ve met convicts before whose service jobs on the inside help people on the outside- and whether this is done as penance or to stave off the monotony of life behind bars, it’s always such a strange narrative pleasure to see “bad” people doing good things. Eddie, accomplice to two nasty murders, is a genius with dogs. 4 Paws for Ability, a service dog training facility, places puppies with qualified prisoners for two months of intensive basic obedience training before they leave to specialize as seizure dogs or autism companion animals, and Eddie is one of their best trainers. When my editor told me that I’d be photographing Eddie with Zeus, I pictured a German Shepherd or a mastiff or something. 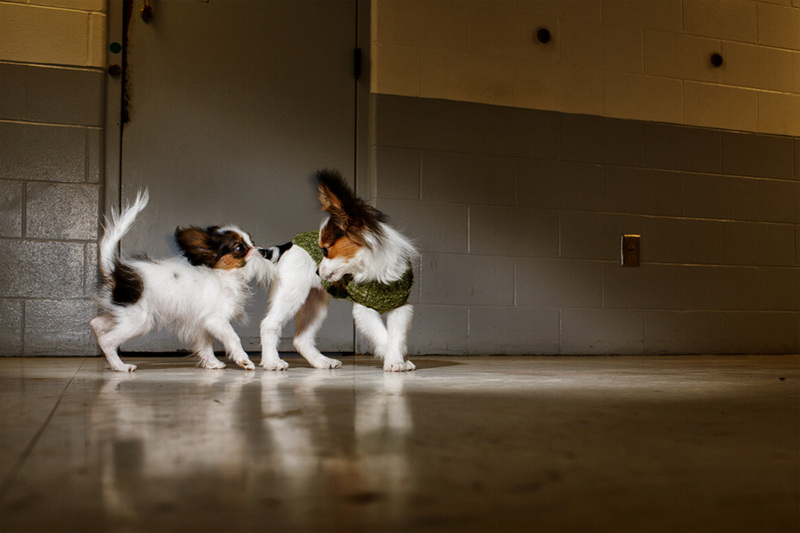 I arrived to the prison and saw Eddie with the cutest, tiniest papillon and it took every ounce of discipline I had not to turn into an irrational squealing squeeze monster. And what’s cuter than one tiny papillon puppy? Two tiny papillon puppies, obviously. Because there is a cellblock at this prison full of the well-behaved prisoners and their puppies. I know someone somewhere is thinking this is a solid calendar opportunity. Read the story, it’s excellent. Posted on 03/09/2015 12/13/2016 by Melissa Golden. This entry was posted in Feature, Readers Digest and tagged dog training, dogs, Feature, Ohio, On Assignment, Prison, Readers Digest. Bookmark the permalink.